Jay McTighe brings a wealth of experience developed during a rich and varied career in education. He served as director of the Maryland Assessment Consortium, a state collaboration of school districts working together to develop and share formative performance assessments. Prior to this position, Jay was involved with school improvement projects at the Maryland State Department of Education where he directed the development of the Instructional Framework, a multimedia database on teaching. Jay is well known for his work with thinking skills, having coordinated statewide efforts to develop instructional strategies, curriculum models, and assessment procedures for improving the quality of student thinking. In addition to his work at the state level, Jay has experience at the district level in Prince George's County, Maryland, as a classroom teacher, resource specialist, and program coordinator. He also directed a state residential enrichment program for gifted and talented students. Jay is an accomplished author, having coauthored 10 books, including the best-selling Understanding by Design series with Grant Wiggins. He has written more than 30 articles and book chapters, and has published in leading journals, including Educational Leadership (ASCD) and The Developer (National Staff Development Council). Jay has an extensive background in professional development and is a regular speaker at national, state, and district conferences and workshops. He has made presentations in 47 states within the United States, in 7 Canadian provinces, and 18 other countries on 5 continents. Jay received his undergraduate degree from the College of William and Mary, earned his master's degree from the University of Maryland, and completed post-graduate studies at Johns Hopkins University. He was selected to participate in the Educational Policy Fellowship Program through the Institute for Educational Leadership in Washington, DC, and served as a member of the National Assessment Forum, a coalition of education and civil rights organizations advocating reforms in national, state, and local assessment policies and practices. Contact information: Jay McTighe, 6581 River Run, Columbia, MD 21044-6066 USA. Grant Wiggins (1950-2015) was president of Authentic Education in Hopewell, New Jersey. He earned his EdD from Harvard University and his BA from St. John's College in Annapolis. Grant and his colleagues consulted with schools, districts, and state and national education departments on a variety of reform matters. He and his colleagues also organized conferences and workshops, and developed print and web resources on key school reform issues. Grant was perhaps best known for being coauthor, with Jay McTighe, of Understanding by Design, the award-winning and highly successful program and set of materials on curriculum design used all over the world, and of Schooling by Design. 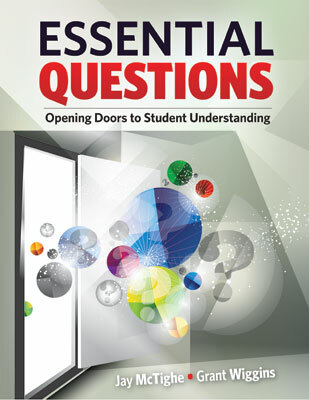 He was also a coauthor for Pearson Publishing on more than a dozen textbook programs in which UbD is infused. His work has been supported by the Pew Charitable Trusts, the Geraldine R. Dodge Foundation, and the National Science Foundation. For 25 years, Grant worked on influential reform initiatives around the world, including Ted Sizer's Coalition of Essential Schools; the International Baccalaureate Program; the Advanced Placement Program; state reform initiatives in New Jersey, New York, and Delaware; and national reforms in China, the Philippines, and Thailand. Grant was widely known for his work in assessment reform. He was the author of Educative Assessment and Assessing Student Performance, both published by Jossey-Bass. He was a lead consultant on many state assessment reform initiatives, such as the portfolio project in Vermont and performance assessment consortia in New Jersey and North Carolina. Several journals have published Grant's articles, including Educational Leadership and Phi Delta Kappan. His work is grounded in 14 years of secondary school teaching and coaching. Grant taught English and electives in philosophy, coached varsity soccer and cross country, as well as junior varsity baseball and track and field. He also played in the Hazbins, a rock band.